Active in Southern California as soloist, chamber musician, educator, producer and arranger, Jenny Jee-El Park received her B.M. in Piano Performance from the Manhattan School of Music and M.A. in Music Education from Teachers College of Columbia University. 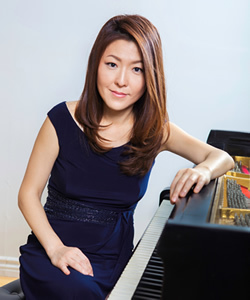 Since her first public recital at age 15 in Italy, Ms. Park made her Carnegie Hall debut in 1998 as the Winner of Artists International Special Presentation Award, followed by numerous concerts in Europe, Asia and throughout North America. In addition, her compositional work, “Lift High the Cross,” was published in 2017 under the Jubal House imprint, and distributed through the Fred Bock Music Company/Hal Leonard companies. She performs with an experimental trio that combines jazz and classical medium as well as more traditional chamber group called Verismo Ensemble. Recently appointed by the Mayor of her city as the Commissioner of Culture and Fine Arts, Ms. Park works in various settings to promote arts in the community. She has worked at the Orange County Children’s Therapeutic Arts Center as music curriculum consultant, and started a volunteer-based music program for the homeless children at the Orange County Rescue Mission. Formerly a faculty member of the United Nations International School, Concordia Conservatory, and Bethesda University, she currently teaches at Vanguard University in Costa Mesa, California.